Just when you thought party season was over after the holidays, along come more reasons to gather and celebrate - the Golden Globes, the City of Lakes Loppet, and, oh, that big football game coming to town in February. Americans typically eat a staggering amount on Super Sunday – the only day of the year we consume more is on Thanksgiving. When you host the party, you control the menu, so you can celebrate while sticking to your food plan. 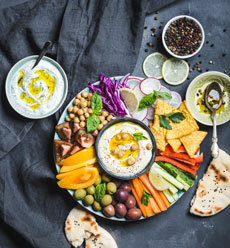 Try Chef Marshall’s tips for hosting a tasty, nourishing celebration that will leave you and your guests feeling great. Cauliflower Buffalo “Wings” – Baked in hot sauce and dipped in real bleu cheese dressing, these substitutes for the real deal satisfy your taste for wings without dragging you down. Cheddar-Cannellini Fondue –Chef Marshall’s lighter take on traditional fondue is perfect for dipping fresh veggies, whole grain crusty bread or even our Turkey Wild Rice Meatballs. Guacamole – Loaded with healthy oils from avocado and healing ingredients like garlic, cilantro and lime, guacamole is one of the healthiest and most delicious, party foods around. Add veggies, like diced tomatoes, garlic, onions and cilantro, and dip some crudité or blue corn tortilla chips. Turkey Wild Rice Meatballs on a Stick – Show your Minnesota pride with these state fair-inspired appetizers and, for a festive touch, garnish the platter with fruits or veggies in your team’s colors. Not only is wild rice an important native Minnesotan grain but it is also a great source of fiber and nutrients. Serve it with Chef Marshall’s easy onion dip (below). Easy Onion Dip – Mix together your own dip using finely diced onion and plain Greek or regular yogurt. This is much better than the store-bought versions that are so full of salt, sugar and artificial chemicals. Better Beverages – For many, it wouldn’t be a party without wine, beer and cocktails – but the best hosts offer fun ways to hydrate between alcoholic beverages. Fruit-infused water and unsweetened flavored sparkling waters are delicious alcohol alternatives. Your guests will thank you when they wake up headache free the next morning! Don’t throw those New Year’s resolutions out the window with your first party of the year! Host a delicious, fun event that keeps you on track with your wellness goals. Chef Marshall’s nourishing takes on classic party foods help you throw a better bash you and your friends will remember without regret.